When the first Exquisite Collection Basketball set was announced six years ago, collectors had never seen anything like it. The product’s concept was so unique that there weren’t many people around who knew what to expect. Message boards were at a fledgling state, blogs were pretty much non-existent, and a lot of the hobby functioned on word of mouth and previews in the hobby media. Because of this, there were many dealers who didn’t want to take the risk on such an expensive product; some even flat out refused to carry it on principle. But once the packs hit the market and people started to open them, it became clear how much of an impact it would make on the landscape of the hobby. The basketball rookie class of 2003-2004 was slated to be one of the best ever, mainly due to LeBron James coming out of high school to a throne seemingly built for him in the hobby. People were salivating, readying their collections as hype continued to build around the class that would change the face of basketball forever. When the first products of the year were released, LeBron, Carmelo Anthony, and Dwayne Wade’s cards were soaring higher than most had ever expected (even more so when fan favorites like SPX and Ultimate Collection hit shelves). Then came a product that cost as much per box as an entire case of regular Upper Deck usually cost. The specially designed box was beautiful in itself, highlighting the standards this product was out to set. Even the common cards were rare, complementing the patch cards which fulfilled collector’s wildest dreams. 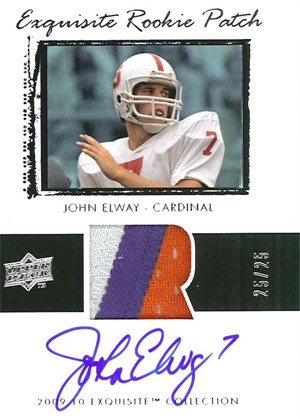 It was not an immediate hit, but when word of mouth proclaimed that this was THE product to get, Upper Deck sold through the entire production run. Ironically, the dealers who originally refused the boxes would probably do anything to get their hands on one now. In fact, an unopened box usually will sell for over ten times the cost of what it was going for originally upon release. This example alone is a true representation of what Exquisite has brought to the table over the years. Fast forward to today, and that 2003-2004 set has become one of the most valuable modern day products around. 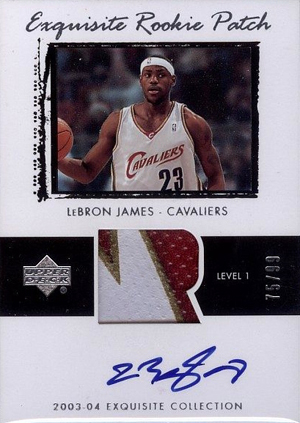 LeBron, now arguably the best player in the league, has more than a handful of 03-04 cards that eclipse $5,000 regularly on eBay (and the concept of the product has now spread to all of the big four sports). Whether you are buying anywhere from a box to multiple cases of Exquisite each year, you know that the content of the set will be on the cutting edge of what is available in the hobby. Coming next week, 2009-2010 Exquisite Collection will be released to much anticipation for one last hurrah. It sold out in a matter of hours, which speaks to the level it will be missed in the coming years. Despite the fact that it may not be around for a while after this year, it isn’t going to go quietly into the night. This year’s design is a tribute to the original 2003-2004 release . . . though this time, there are going to a few additions that have actually made the hairs on the back of my neck stand on end. This week, we got our first taste of what these additions look like, and they are shaping up to be some of the most absurdly amazing cards ever produced. For the first time, UD exclusive spokesman Tiger Woods, will share a card with other UD spokesmen, including dual autos and patches with Michael Jordan and LeBron James. 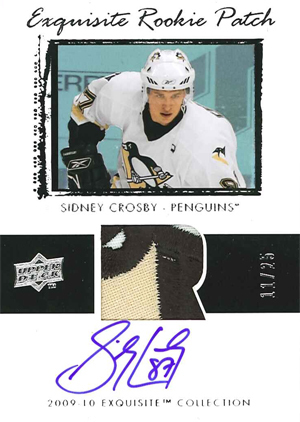 As if that wasn’t enough to add to the normal fare, fan favorite Sidney Crosby will have his first Exquisite branded card ever, as well as some favorite football players like former Broncos HOF quarterback John Elway. It will also have extremely sought after rookie cards of the new NBA draftees, and all of this is not even the full picture yet. As with most years, there are bound to be surprises, so who knows what Exquisite has up its sleeve for its farewell tour. Though the Exquisite concept is often imitated, it has yet to be duplicated. Basketball collectors have especially made Exquisite their banner, bringing its success to levels that were never expected back in 2003. There are even entire websites devoted to following the rare chase pulls, as there are tons of collectors who plan their spending for the entire year around the release date. Also, LeBron isn’t the only one with Exquisite cards that approach the price of a small car, as players like Sidney Crosby, Tiger Woods, Adrian Peterson and Michael Jordan have all brought new definition to high end prices. However, as Jordan, James, Woods and company are exclusive to UD products, it will be very tough for any other product to come close to the content Exquisite delivers every year. Basically, once Exquisite Basketball is gone, the impact of its departure will be just as remarkable as the initial buzz that came when it arrived. Personally, I look forward to each Exquisite set every year, at least just to live vicariously through the astounding pulls of lucky collectors on the internet. Regardless of the fact that Exquisite Basketball won’t be around next year, I can tell you that nothing has ever garnered my excitement quite like what is coming next week. Keep yourself glued to the Upper Deck Facebook page, as more images should be posted up until release. You can also connect via Twitter and at many of the card blogs, as Exquisite news always travels quickly. Upper Deck Announces Plans for NHL Entry Draft!